Heavy boxes. Days of packing. Lugging furniture up and down the stairs. Long drives and late nights. Sounds like fun, right? The average American moves 11.4 times per lifetime, according to fivethirtyeight. And that’s very surprising for many reasons. The main reason, however, is the fact that moving is so unpleasant for most of us. Whether you’re making a short move across town, or a move from a small Cincinnati apartment to an expensive Los Angeles neighborhood, packing up your entire life can be stressful, super expensive, and will take up a ton of your time. But don’t you worry! There are a few quick tips you can follow to make things easier on yourself when it comes time to move. Here are some strategies you can implement to make your move as quick, painless, and financially-friendly as possible. 1.Fill Those Empty Spaces & Forget Packing Peanuts. We all have a ton of stuff to move. So, it’s time to run to the store and grab the packing peanuts, right? Wrong! Think about the things you already own that can be used to help fill those empty spaces in your boxes — t-shirts, towels, and bedding can go a long way and will be much cheaper options that purchasing packing peanuts. This will save you money and it’ll be much easier to clean up. Plus, your electronics won’t have bits of white styrofoam all over them when you unpack. You might even be able to find another use for those old packing peanuts. Moving boxes can get expensive, especially if you have a lot of stuff to move. Visit your local office supply store first. Office supplies ship in sturdy boxes, so they often have a ton left over. Think of all the printers and appliances they must receive each day — surely they have a few extra boxes laying in the back room. These are perfect boxes for videos and books and other heavy objects. And they’re even better when they’re free. Also, visit your local liquor and grocery stores. They also have a ton of incoming product that arrives in boxes. You’d be surprised at how happy they are when they get to pass along their boxes to you rather than lugging them out to the back for recycling. Just make sure the boxes are in good shape. The last thing you want is to save a few bucks on boxes only to have them break when you start piling your belongings into them. Hiring great movers can really take so much of the stress off of your shoulders. But it’s important to put those professionals in the best place possible to succeed and do a great job in helping you move. Don’t wait until the last minute before movers arrive to start organizing your materials. Take a few days to organize your belongings, pack them into color-coordinated and clearly labeled boxes. This will help your movers in a huge way! In order to organize a successful relocation, you should start the preparations early. Before the movers arrive, make sure you have a clear, focused plan for the day and that your place is well organized and that it’s easy to move around. Your movers will be greatly appreciative of your preparation efforts. As you pack your glasses, plates, bowls, wine bottles and other expensive and breakable items, be sure to use bunched up paper and bubble wrap as padding. 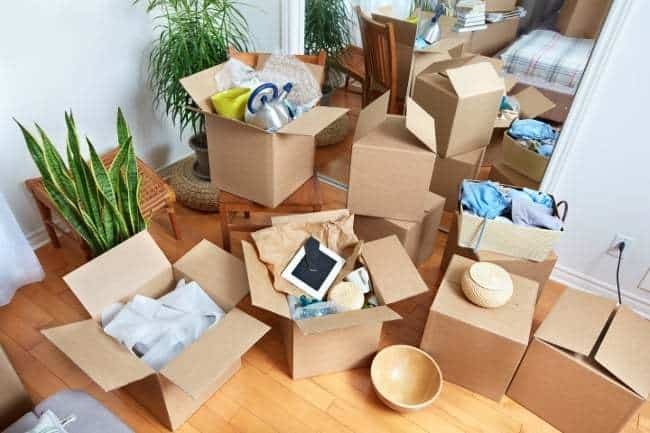 These packing materials are extremely inexpensive, but if you end up breaking a lot of your dishes during a move, well, that will cost you more than you want to know! You can pack your cups and bowls inside of each other to save some space and help to protect them as well. Also, remember that your electronics will need protection as well. Don’t just toss your computer and monitors in a box and hope for the best. Ask for the movers help and expertise on packing breakable objects. You hired them, after all, so you might as well consult them for the best packing tips and advice. Either way you slice it, moving is a difficult, time-consuming and expensive task. Whether you’re someone with bad credit saving money to purchase a home while moving from apartment to apartment; or, if you’re a wealthy businessman who upgraded to a new family mansion, everyone wants to save a few bucks when they can. And we all want to make a move less stressful if that’s an option, too. So, use the tips above and get prepared for your easiest move yet!